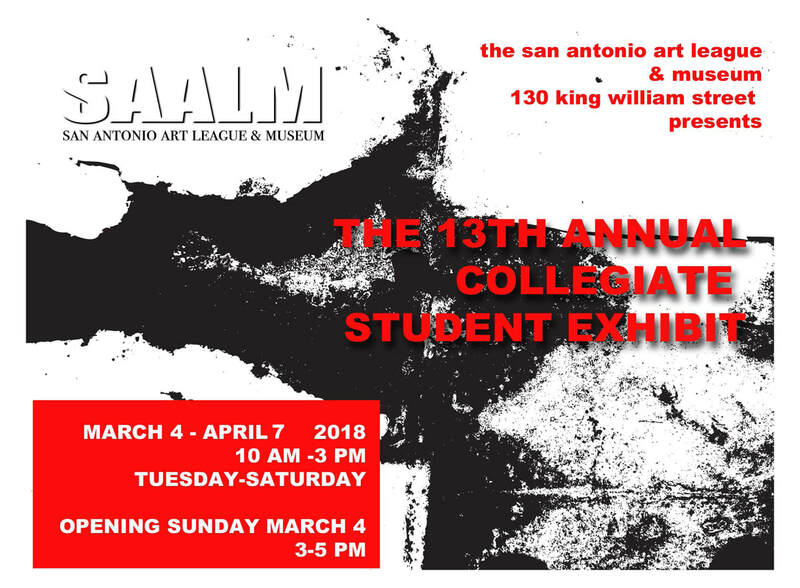 The San Antonio Art League & Museum opens its annual Collegiate Student Exhibition Sunday, March 4 with a reception from 3-5 p.m. The exhibition continues through Sunday, April 7. Work by students from the art departments at St. Mary’s University; San Antonio College; Trinity University; the University of the Incarnate Word; and the University of Texas, San Antonio, will be exhibited. The exhibition is juried by the Art Department faculties at each of the participating colleges and universities. A variety of media are selected for the exhibition, including sculpture, ceramics, paintings, prints, photography and electronic media. The exhibition is important because the San Antonio Art League & Museum is the only cultural arts institution in San Antonio that provides a professional venue for an exhibition specifically for collegiate entrants. Not only is it an honor for students to be selected for the exhibition, but their participation provides them with an exhibition credit, beyond academic exhibitions, with which they can begin to develop a professional artist’s portfolio.